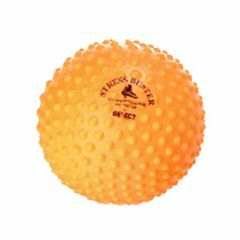 The Stress Buster Ball will help eliminate tension, stress, & relieve sore muscles. Everyday use of the Stress Buster can improve circulation, reduce stress, and relax muscles. This air filled ball has sensory bumps to encourage stimulation and is ideal for self-messages. Just lean against the wall with the ball sandwiched in the middle and move around until the sensory bumps on the ball are in contact with the muscles that are in need of tension relief. You'll be amazed how effective it is! for some reason I expected a 20cm ball, this was very small and very stiff.